Drooping eyelid, also known as blepharoptosis or ptosis, occurs when the edge of the upper eyelid droops to a position that is lower than it should be. When this condition is severe, the droopy eyelid can cause vision issues by covering the pupil. This condition may be intermittent where it comes and goes, or progressive, where it is always there and gets worse as time goes on. Drooping eyelid may affect one or both eyes. When the condition is unilateral, affecting only one side, it is easy to see the difference between the two eyes. When it affects both eyes in slight condition, it is harder to notice or determine the severity. Drooping eyelid may be caused by a number of medical conditions, including diabetes, Horner syndrome, stroke, myasthenia gravis, migraine headaches, or cancer that affects muscles or nerves, such as a brain tumor. It can also be caused by normal aging or allergies. Drooping eyelid can be present at birth, which is known as congenital ptosis. Drooping eyelid can also be caused by an eye tumor. If just one eyelid is affected, causes may also include normal variation between eyelids, nerve injury, or a sty or other eyelid growth. If both eyes are drooping, the causes could be myasthenia gravis, normal aging, or migraine headaches. Myasthenia gravis is a rare condition that impacts the way in which muscles react to nerves. It causes muscle weakness throughout the body that gets worse over time. Drooping eyelid is often one of the first signs of myasthenia gravis. Conditions that cause injury to cranial nerves or to the brain itself can cause eyelid drooping, such as a brain tumor, stroke, brain aneurysm, or nerve damage caused by diabetes. This is because nerves that begin in the brain are responsible for controlling eye muscles. 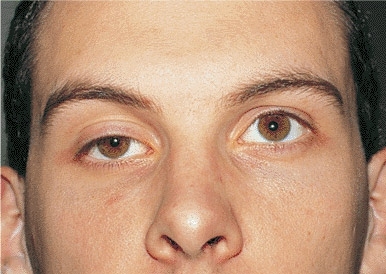 Horner’s syndrome can cause drooping eyelid on one side along with a pupil that is smaller than normal and the inability for one half of the face to produce sweat. Here are some ways to deal with drooping eyelid, based on the cause of the condition. If you have drooping eyelid as a result of an allergic reaction, see your doctor about steroid or antihistamine medication. If nerve injury has caused your drooping eyelid, contact your doctor to inquire about surgical options. For other causes, follow the treatment plan provided by your doctor. When this condition is caused by aging, treatment is only necessary if your vision is impacted or your physical appearance is greatly affected. In these cases, surgery to raise your eyelid can be performed by a plastic surgeon. In most cases, this procedure can be completed with local freezing while you are awake and you can go home the same day. The reason that it is preferred that you are awake during this surgery is so that the doctor can check the readjustment of your eyelid in comparison to your open eyes. When an infant is born with severe congenital ptosis, corrective surgery is usually done right away in order to reduce the possibility of damage to sight. If the congenital ptosis is less serious, the surgeon may recommend waiting for 3-5 years. Children who have corrective surgery for this condition are normally put to sleep during the procedure. In cases where surgery is the recommended treatment for drooping eyelid, be choosy when deciding on the surgeon who will complete the procedure. You or your child’s appearance as well as other issues, such as dry eye if eyelids do not close properly after surgery, can occur if the surgery is not completed properly. Be sure to ask the surgeon questions, such as how many eyelid surgeries the doctor has completed. Ask to see photos of previous patients before and after the procedure and whether you can talk to individuals who have already had the surgery. General prognosis for eyelid surgery is positive. This treatment is usually successful for both children and adults. Occasionally, this surgery results in the eyes not closing completely when sleeping, resulting in the need for an eye lubricant at night to keep the eyes from drying out.